We propose you to become the golf champion! It is quite easy to play, just try to hit the target and reach the hole. Do you think that it is so easy? Well, then just try it! Are you ready for such a cool challenge? Then do not waste your time and play this game! 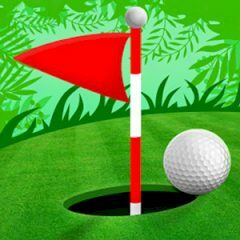 In this game there are a lot of levels to keep you busy while trek through the tough terrain you start with some basic putts to get the hang of the game but move on to more challenging mini golf holes. Here you have to watch out for holes in the course, spinners, spring boards and crazy gaps. It's a real challenge to finish the game but still fun of course. Mini Golf really never has been so fun, Jungle Golf combines the classic elements of play with easy to use touch controls. Are you ready? Then go!